Following the epic 1927 flight of Charles Lindbergh, a wave of flying fever swept America. 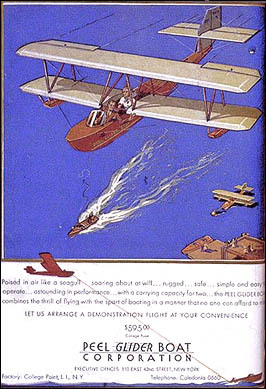 As the price of aircraft was still far above what most people could afford, a number of manufacturers developed simple low-cost gliders to fill the void. One of these was the Peel Corporation of College Point, Queens. Priced at $595, this was the only American flying boat glider. Peels were intended to be towed aloft behind a speed boat. At 1000 feet altitude the tow rope would be released so the glider could soar on its own before landing on the water. A total of 30 Peel Glider Boats were built, before the company folded due to the Depression. This is the sole surviving example.